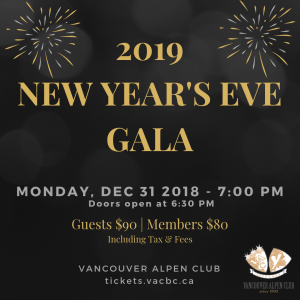 Welcome to the 2019 NYE Gala at the Vancouver Alpen Club. We will provide you with a mouth-watering Gourmet Buffet and Dance Music by the Euroband throughout the night. At midnight we will cheer together with a glass of Henkell Trocken into the New Year! If you are planning to buy Member Tickets, please have your updated valid Membership Card ready to show at the door. Only cardholders are eligible for member rates, this doesn’t include family members or friends. If you fail to prove your Membership additional fees will apply. Tickets are non-refundable and non-transferable. Before purchasing tickets, carefully review your event and seat selection.